Hauntingly beautiful! Those are the two first words that come to mind when describing Abubakar Adam Ibrahim’s ‘The Whispering Trees’. I’m always very excited to read a story that has a title that instantly transports you. I don’t know about the rest of you, but titles play a big part in my book selection process. ‘Whispering Trees’, I repeat those words in my head over and over again, almost as if warming my mind up, preparing myself for a voyage. The story opens up with the voice of Salim, a young Nigerian man, recounting his near death experience after being involved in a tragic car accident that claimed the life of his mother and his sight. As we journey with Salim through his memories of early childhood, his hopes for the future and shattered dreams, his frustration at what his life is to become is almost palpable. Salim seems to have all but given up on life, but through the quiet devotion of his fiancée Faulata he finds the will to live again. Yet just when you start to see the colour seep back into his story, Faulata leaves him and Salim’s life goes all dark again. His depression is so poignant, its almost irritating, to the point of making one want to scream out at him. This is a story about the strength of the human soul and how the miracle of a gift can change the life of an individual forever. As we soon discover, Salim’s misfortune becomes a gift, a gift so beautiful and enchanting that any lingering feelings of pity or anger that we shared with Salim are instantly replaced with an acute sense of hope. In the three days Salim spends discovering his new life, he visits a place he loved to play in as a child, known as the ‘woods of the spirits’ or the ‘Whispering Trees’. It is in this place where so many of his memories were born, that he begins to understands that the loss of his sight has been replaced with a purpose in life so grand that it both scares and humbles him. I myself am not a writer or an editor, so any praise or criticism I may have about Ibrahim’s story will not be about structure or style, but the sentiments I experienced in reading it. I love stories told through first-person narration; I almost feel like I’m right there with the person, living their ordeal their joy, and the best part is the feeling that they are sharing with you their most intimate thoughts and wishes. Ibrahim does this perfectly with Salim. He lets his characters politely introduce themselves to you, giving them all very distinct voices and strong personalities. But instead of using his authorial voice to describe his characters, he lets Salim do the talking, completely detaching himself from the story and instantly creating a bond between reader and character. What I love about Ibrahim’s story is the manner in which he takes a rather hopeless situation, a true human tragedy, and turns it into something beautiful, leaving the reader with a renewed sense of hope. Salim’s story feels so real, loss is all around us, yet as you read on you feel like you are in a constant dreamlike state, transported to another world. Is that not why we read? To travel? Well, I cant wait to take to see where the rest of Ibrahim’s storytelling will take me; my bags are packed and I’m raring to go. Sylvia Gasana is currently studying for an MA in Media Practice for Development and Social Change at the University of Sussex. She works as a communications professional and was part of the team behind Spoken Word Rwanda’s first literary festival in 2012. You can read Abubakar Adam Ibrahim’s ‘The Whispering Trees’ and the other shortlisted stories on the Caine Prize website. This post is part of the third week of Blogging the Caine 2013, in which a group of writers organised by Aaron Bady write about the shortlist for this year’s Caine Prize. If you’d like to participate in ‘Blogging the Caine 2013′ email Aaron Bady (aaron AT thenewinquiry DOT com) or join the conversation here or on twitter (#caineprize). 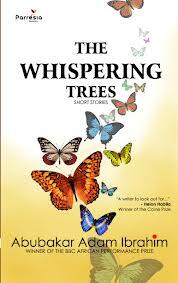 Sylvia Gasana’s thoughts on The Whispering Trees are shared on the blog Africa in Words. The first time when I read the story, it was unbelievably bonding and touching. So I took it again for the second time. Abubakar had wrote something that is extremely live and gives us a sense of pain and of decision. That’s a hell of a novel worth reading. It shades an important light that is worth the price.